The eastern Free State’s apple orchards are doing well with a small edge in marketing time over the more established orchards of the Western Cape. Lloyd Phillips talks to Charles Smith of Fyvie Farming. The eastern Free State areas of Harrismith, Bethlehem, Reitz, Clarens and Fouriesburg form an island of commercial apple production. In the Western Cape there are commercial apple orchards in productive 80th leaf (80 seasons old) while in the eastern Free State, where large-scale apple farming only started in 1996, the orchards are approximately 17th leaf. But Free State apples are making a mark on South African apple industry and the export apple markets. Charles Smith, of Fyvie Farming, began working in the eastern Free State commercial apple sector in 1997. Charles studied agronomy and animal husbandry, graduating from Elsenburg College in 1978. He spent nearly two decades working in South Africa’s red meat value chain before switching in 1997 to managing a commercial apple operation in the Harrismith area. In 2001 he joined Neil and Pam Fyvie of Fyvie Farming where he currently manages 62ha of commercial apple orchards. Fyvie Farming produces about 2 800t/annum of Royal Gala (19 ha), Top Red (3 ha), Fuji (12ha), Cripps Pink/Pink Lady (21 ha) and Cripps Red/Sundowner (7ha) apple varieties. About 80% is for national sale and the rest is exported to the UK, the EU, the Far East and into Africa. The trees are planted at a density of 1 536 trees/ha with an inter-row spacing of 4,5m and an intra-row spacing of 1,5m. Neil and Pam Fyvie maintain the integrity of their brand by instituting strict traceability and certification systems. And Charles Smith(right). They also plant Golden Delicious, Braeburn or Granny Smith apple varieties at a 10% ratio in each orchard to act as essential cross-pollinators to the main apple varieties. 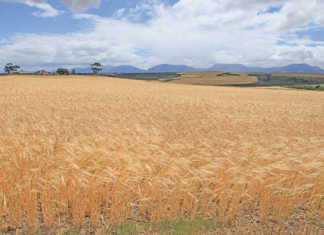 The Harrismith area has summer weather suited to apple production. Day temperatures are usually mild, rarely exceeding 30°C, and nights are cool, which makes for a positive contribution to colour development in the growing apples. Winters can be harsh, with temperatures as low as -13°C. 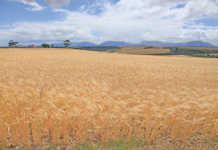 Fyvie Farming’s Top Reds yield about 55t/ha and the Fuji yield is about 70t/ha. Eastern Free State producers have a head start, with their apples ready for marketing two to four weeks before the Western Cape apples. This is when local and export apple prices peak. Prices gradually decline as the season lengthens and more SA-grown apples find their way onto the markets. Feeder roots, responsible for nutrient and moisture absorption, are generally found to a depth of 60cm, so probes penetrate to a depth of 80cm. Charles points out that optimal water supply is vital to minimise stress, which would negatively affect apple production. Stress at flowering impacts on fruit set. 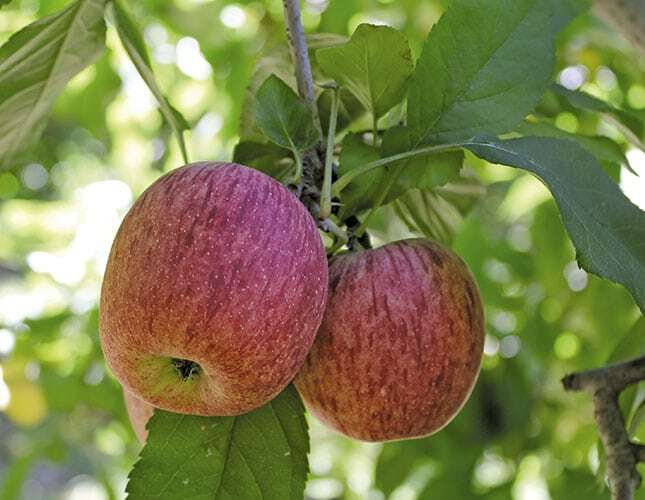 Stress later in the season affects fruit size, and inadequate moisture uptake by the trees towards harvesting can lead to apples being sunburned. At the end of January, leaf samples are sent to the agricultural laboratory, Bemlab, in the Western Cape. In December, soil samples are sent for analysis. Test results are given to Nelius Kapp, a horticulturist and soil scientist who works for Farmsecure Agri Science. Nelius analyses the results. Taking into account anticipated apple yields for different varieties, the varieties, orchard ages, and root stocks used in the orchards, he recommends fertiliser and liming applications for the next 12 months. About 80% of the fruit sorted in Fyvie Farming’s apple packhouse is destined for the national market. The remainder is exported to the UK, EU, Far East and the rest of Africa. Lime is broadcast in July. Depending on Nelius’s recommendations, either dolomitic lime or calcitic lime will be used. Typically, an orchard that needs liming will get 1t/ha to 2t/ha per application. Charles says that up to 10t/ ha of lime is deep-ploughed into the soil when preparing land for a new orchard. He adds that if orchards are properly limed at planting and subsequent annual liming is correctly carried out, only small quantities are required for maintenance, even if the apple orchards are decades old. “We prefer to use liquid fertiliser because granular fertiliser must be hand-applied. This can result in uneven application and sometimes in fertiliser burn because the fertiliser is too close to a tree’s stem.” Charles designed and built a tractor-drawn implement for liquid fertiliser application that incorporates a squeeze pump and a ground wheel. 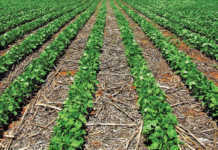 Liquid fertiliser is applied in a band along each ridge, usually within a week of harvesting. It is aimed at achieving 50kg/ ha to 150kg/ha of nitrogen (N) using ammonium nitrate sulphate (ANS) which contains 18% N.
“Sometimes we put down a second application, especially in orchards where dwarfing root stocks, such as M9, are used. As we expand our use of M9 root stocks, more orchards will start getting this second fertiliser application,” says Charles. Pollination is vital for good fruit set and growth in apples. The more fertilised seeds there are in a developing apple, the more nutrients an apple tree will allocate to it. Bees are ideal apple pollinators but, unfortunately, wild bee populations are not big enough to pollinate Fyvie Farming’s hundreds of thousands of spring apple blossoms within the required three-week period. Interestingly, bees prefer wild flowering plants to the flowers of cultivated apple trees. In the first week of September, Fyvie Farming hires about 200 commercial beehives from Highveld Honey Farms in Gauteng. Hives should be strategically placed in an apple orchard when the trees reach 30% blossom. However, to save on the hives’ transport costs, Fyvie Farming arranges for them to arrive in two batches within days of one another. They are immediately placed in the apple orchards. Another pollination challenge is that the bees don’t seem to like flying under the hail nets covering the apple orchards. The nets are opened up in winter, to reduce the risk of snow damage, and normally closed from about 15 September to protect the trees against hail and late frost. To encourage the bees, Charles, Neil and Pam are experimenting with opening the nets for the three-week pollination period. Major pests include woolly apple aphid, bollworm, coddling moth and fruit fly. 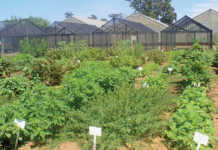 Chemical control programmes for various pests and diseases are devised by Frikkie van Schalkwyk, a pest management expert and consultant to the deciduous fruit industry. “Fyvie Farming aims to produce chemical residue-free fruit. We use ‘soft’ chemicals with a minimal negative environmental impact. We also strive to bring pest and disease pressure under control early in our production season so that the need for chemical applications close to harvesting is at a minimum. We adhere strictly to chemical withdrawal requirements,” says Charles. “Fyvie Farming is GlobalGAP and British Retail Consortium certified, as well as certified by Woolworths Farming for the Future programme.We are regularly audited to check that our production processes and final products meet environmental, employee and consumer health and safety standards,” he concludes. This article was originally published in the 22 March 2013 issue of Farmers Weekly.